Securitization is still in wide use despite the reduction in transactions. The reality is that investors and institutions continue to use this vehicle for raising funds and the demand for their use will continue to rise as the world's capital needs increase. 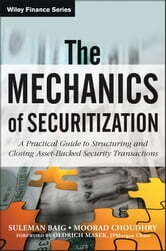 The Mechanics of Securitization specifically analyzes and describes the process by which a bank successfully implements and closes a securitization transaction in the post subprime era. This book begins with an introduction to asset-backed securities and takes you through the historical impact of these transactions including the implications of the recent credit crisis and how the market has changed. While securitization transactions have been taking place for over twenty-five years, there is still a lack of information on exactly how they are processed successfully. This book will put you in a better position to understand how it all happens, and show you how to effectively implement an ABS transaction yourself.